Va James Abram Garfield (19 Sauin, 1831 - 19 Mean Fouyir, 1881) ny 20oo Eaghtyrane ny Steatyn Unnaneysit. V'eh marrooit rish yn eaghtyraneys echey. Roish v'eh er reiht, v'eh ny veoir-ghineraal ayns Armee ny Steatyn Unnaneysit as ny oltey jeh Thie Reihdee ny Steatyn Unnaneysit. V'eh ny nah eaghtyrane dy ve marrooit. 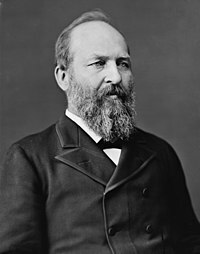 Ta tooilley coadanyn mychione James A. Garfield ry-gheddyn ayns Wikimedia Commons. Hie yn duillag shoh er ny reaghey er 8 Mayrnt 2013, ec 18:07.